“I’m sort of a jack of all trades here,” says Bryce Loewen, a fourth-generation farmer at Blossom Bluff Orchards. “It’s necessary if you’re trying to do what we’re trying to do—which is a lot.” At 34, Bryce is helping grow a 75-year-old fruit business, working side by side with his parents, Ted and Fran, and younger sister, Renata. Since 1931, when Fran’s grandparents purchased a 30-acre plot in Parlier, outside of Fresno, Blossom Bluff has transformed from a conventional orchard with orderly rows into a more untamed, organic one, but the family has always maintained a commitment to quality. 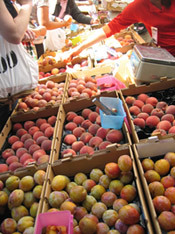 Bryce’s grandfather, Herb, grew about 20 varieties of fruit for the wholesale market—mostly peaches, plums, and nectarines along with a few persimmons. “He was an amazing conventional farmer. I have a lot of respect for him,” says Bryce. In 1990, Ted left his law practice to take over the operation and shifted Blossom Bluff’s focus from commercial distribution to direct sales. Diversity became a necessity in order to establish a niche at farmers markets and ensure a continual supply of fruit from week to week. Ted also transitioned the farm to more sustainable growing practices. For many years, Blossom Bluff was a member of the California Clean Growers Association, a group of 150 Central Valley family farms that promoted the reduction of pesticide use through Integrated Pest Management. In 2006, Blossom Bluff became certified organic, deepening their commitment to environmentally sound farming while opening new avenues for direct sales. 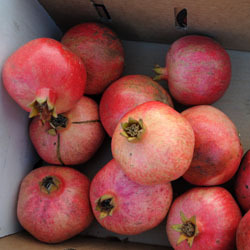 Today, the Loewens grow about 200 varieties of fruit, with a broad array of stone fruit in the summer, persimmons and pomegranates in the fall, and citrus in the winter. Along with a few full-time farm operations and market staff and about 30 seasonal employees, they maintain 70 acres in production, attend six to nine farmers markets, and sell to restaurants and local grocery stores throughout the Bay Area. While many of his rural friends felt pressured to follow in their parents’ footsteps, Bryce never felt those expectations from Ted and Fran. Though he grew up with a deep admiration for the family business, he was ready to pursue his own interests and explore life outside of Parlier once he came of age. He left Blossom Bluff in 1998 to attend Ex’pression College in Emeryville, eventually earning a degree in computer animation. But by the time he finished school, he realized that digital arts was not his true calling. “I didn’t want to stare at a computer for 10 hours a day,” he says. Since 2008, Bryce has been working closely with his parents to learn all of the aspects of the trade, from growing and pruning to marketing and financing. His computer skills and art savvy have become strong assets in developing Blossom Bluff’s branding, advertising, and online presence. 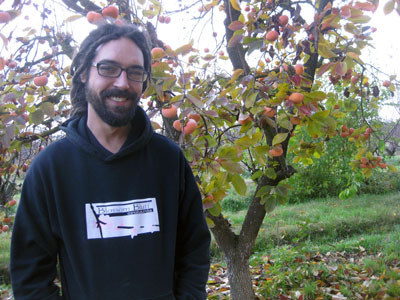 As he assumes a larger role, his goal is to build on Blossom Bluff’s reputation as an organic fruit farm with great diversity, while expanding the farm’s product line. To extend their market season through the less-productive months, the farm currently offers organic dried fruit, and he hopes to branch out into other value-added products, such as fruit leathers. But growing the business is not the end-all, and Bryce hopes to simplify some operations in order to focus on quality control and improving their varieties. “The process of finding good varieties has taken years, and we’re still fine-tuning. It’s a continual evolution.” This means constantly seeking out fruits that that grow, set, and taste just right and fit neatly into their complex growing calendar. Top photo courtesy of Blossom Bluff Orchards.